Peerless-AV today announced the UltraView Outdoors TVs, new line of all-season Outdoor TVs for outdoor home entertainment and living. Weatherproof and maintenance-free, Peerless-AV’s UltraView TVs make it easy and affordable for homeowners to add digital entertainment to their outdoor living spaces. 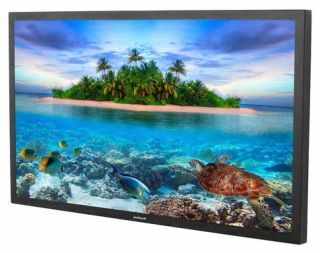 Available in 49", 55" or 65", the TVs are equipped with an LED backlight to provide a full HD 1080p resolution for bright and crisp visuals. The UltraView TVs also come with an IP68 rated waterproof and dustproof universal remote that can be programmed to control up to three additional devices. The UltraView TVs are functional for all seasons, built with weatherproof internal speakers and the ability to operate at a range of -24°F to 122°F, offering users confidence in the TV’s quality and performance. With a fully sealed design, there is no need to change filters or service the TV, creating a maintenance-free entertainment solution for year-round use. Installation of the UltraView TVs is best suited for shaded outdoor areas, out of direct sunlight. It is the perfect addition to a deck, patio, gazebo, hot tub, outdoor kitchen or any high-end outdoor entertainment area. Peerless-AV’s 49" and 55" UltraView TVs are available now through Peerless-AV direct sales representatives and authorized distribution networks. The 65" UltraView TV will be available in July 2016.